About 7 species, the following of eastern North America, the others in the Southern States, California and tropical America. 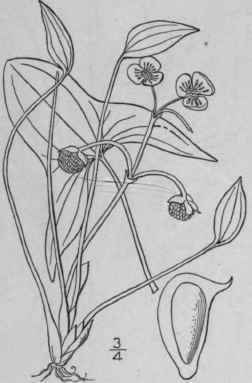 Type species: Sagittaria calycina Engelm. Leaves hastate or sagittate; plants of fresh-water ponds or marshes. Leaves with large basal lobes fully as long as the terminal one. Leaves with small basal lobes shorter than the terminal lobe. Leaves imperfect or obsolete, the phyllodia thick or partially flattened; plants of salt or brackish water. Phyllodia terete or nearly so, prominently nodose-septate. Phyllodia flat, more or less spatulate, not prominently nodose. 61. 1881. 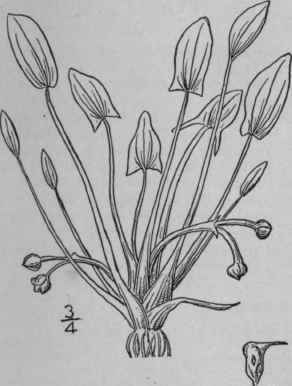 Lophotocarpus calycinus (Engelm.) J. G. Smith, Mem. Man. Ed. 7, 84. 1908. Plants mostly emersed; leaves 1/2°-2° tall, the petioles stout, the blades sagittate, hastate or lunate, 2 1/2-12' long, the basal lobes usually longer than the broad terminal lobe, usually caudate-acuminate; scapes shorter than the leaves, the inflorescence usually simple, with 2-7 whorls; sepals suborbicular to orbicular-reniform, becoming 4 1/2"-7 1/2" long; fruiting pedicels very thick, usually elongate, mostly 1 1/4"-2" long; fruit-heads 5i"-8" in diameter; achenes broadly cuneate, 1"-1 1/4" long, the beak stout, the dorsal wing thin. In swamps, South Dakota to Delaware, Alabama, Texas and New Mexico. July-Sept.
Lophotocarpus depauperatus J. G. Smith, Rep. Mo. Bot. Gard. 11: 148. 1890. 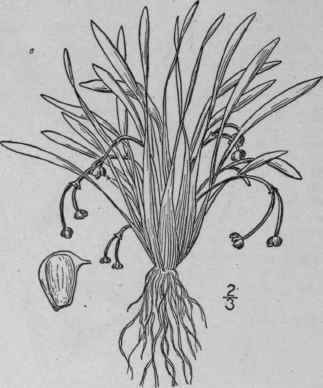 Plants mostly emersed; leaves 1/2°-1° tall, the petioles relatively slender, the blades oblong, elliptic, sagittate or hastate, 3/4'- 1 1/2' long, including the basal lobes which are usually more or less spreading; scapes about one-half as long as the leaves, mostly with 1 or 2 whorls; sepals suborbicular, becoming 3"-3 1/2" long; fruit-bearing pedicels rather stout, 1/3'-1 1/4' long; fruit-heads 3V-4" in diameter; achenes cuneate, fully 1" long, or rarely shorter, the beak slender, the dorsal wing thin. On margins of ponds, Wisconsin to Illinois, Missouri and Oklahoma. June-Sept.
Rep. Mo. Bot. Gard. 11: 148. 1899. Plants submerged; leaves 1/3°- 2/3° tall, the petioles stout and spongy, conspicuously nodose-septate, the blades spatulate, oblong, elliptic, sagittate or hastate, 1/3'-1 1/4' long, the basal lobes, when present, more or less falcate; scapes about one-half as long as the leaves or less, the inflorescence simple, with one or two whorls; sepals broadly ovate or orbicular-ovate, becoming 5"-6" long; fruiting pedicels very stout, 1/3'-3/4' long, or rarely longer; fruit-heads 3 1/2"-5" in diameter; achenes cuneate, i"-i 1/4" long, the beak short, at the top of the achene-body, the dorsal wing thin. On margins of brackish ponds and tide-water marshes, New Brunswick to Virginia. July-Aug.
Lophotocarpus spathulatus J. G. Smith, Rep. Mo. Bot. Gard. 11: 149. 1899. 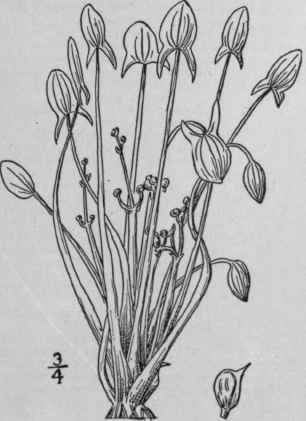 Plants aquatic; leaves less than 4' tall, the petioles stout, not conspicuously septate, the blades linear or spatulate dilations at the top of the petioles, or wanting; scape shorter than the leaves, stout but weak, the inflorescence with but one whorl; sepals ovate to orbicular-ovate, becoming 1 1/2" long; fruiting pedicels stout, about 5" long or less; fruit-heads 2V-3" in diameter; achens cuneate, 3/4"-1" long, the beak much below the top of the achene-body, the narrow dorsal wing thin. On sandy beaches above salt-water, New-buryport, Massachusetts. July-Sept.